HGTV $25 Grand in Your Hand Sweepstakes – Win $25,000! ENTER SWEEPSTAKES HERE – HGTV Sweepstakes page. Each Tuesday starting January 6, watch Fixer Upper at 9/8c for a special code word. I will post the code word each week, so if you don’t see the show – you can still enter! ENTRY LIMIT – Limit one entry per person, per week. ELIGIBILITY – The Sweepstakes is open only to legal residents of the fifty (50) United States and the District of Columbia (excluding Puerto Rico, Guam, the U.S. Virgin Islands and other United States territories), who are twenty-one (21) years of age or older as of the start of the Sweepstakes Period and who have access to the internet and HGTV prior to learning of this Sweepstakes. SWEEPSTAKES PERIOD – HGTV 25 Grand in Your Hand Sweepstakes begins at 9:00:00 pm Eastern Time (“ET”) on 1/6/15 and ends at 8:59:59 pm ET on 1/28/15. The Sweepstakes Period will consist of four (4) separate and individual Entry Periods. PRIZES – Grand Prizes and Approximate Retail Value (“ARV”):Four (4) Grand Prizes are available to be awarded throughout the entire Sweepstakes Period (one (1) per Entry Period) (each, a “Grand Prize”). Each Grand Prize winner, once confirmed, as detailed below, will receive one (1) check for Twenty-Five Thousand Dollars ($25,000). The ARV of each Grand Prize is Twenty-Five Thousand Dollars ($25,000). RULES – See sweepstakes rules here . HGTV 25 Grand in Your Hand Sweepstakes – Win $25,000 – new code added! HGTV has a new sweepstakes that started today Nov. 26, 2014! You could win $25,000 – there will be 4 winners (one for each weekly entry period)! There will be a code word shared on HGTV each Tuesday night (during Property Brothers, I believe), starting Nov. 26. I will add the code word as soon as I have it. ENTRY LIMIT – There is a limit of one (1) Entry, per person, regardless of email address used, per Entry Period. Entries will NOT be carried forward into subsequent Entry Periods’ Random Drawings, if any. ELIGIBILITY – The Sweepstakes is open only to legal residents of the fifty (50) United States and the District of Columbia (excluding Puerto Rico, Guam, the U.S. Virgin Islands and other United States territories), who are twenty-one (21) years of age or older as of the date of their entry and who have access to the internet and HGTV prior to learning of this Sweepstakes. SWEEPSTAKES PERIOD – HGTV 25 Grand in Your Hand Sweepstakes begins at 9:00:00 pm Eastern Time (“ET”) on 11/26/14 and ends at 8:59:59 pm ET on 12/18/14. Shaw Floors 30 Days of HGTV® Sweepstakes – Win a $2,500 Shaw Floor Makeover! Win a $2,500 Shaw Floor Makeover! ENTER SWEEPSTAKES HERE – Shaw Floors Facebook page. ENTRY LIMIT – Limit one (1) Sweepstakes Entry per Entrant per day. ELIGIBILITY – The Promotion is open only to entrants who are either (a) legal United States residents who are physically residing in one (1) of the 50 United States/District of Columbia and who are at least eighteen (18) years of age or older as of the date of entry, or (b) legal Canadian residents who are physically residing in Canada, excluding the Province of Quebec, and who are over the age of majority in their province/territory of residence as of the date of entry. SWEEPSTAKES PERIOD – The Shaw Floors 30 Days of HGTV® Promotion begins on August 11, 2014 at 12:00 AM Eastern Time (“ET”) and ends on September 30, 2014 at 11:59:59 PM ET. PRIZES – Sweepstakes Grand Prize (1): The Sweepstakes Grand Prize Winner will receive a USD $2,500 / CAD $2,670.44 Shaw Flooring Makeover. The ARV of the Sweepstakes Grand Prize is USD $2,500 / CAD $2,670.44. Sweepstakes First Prizes (34): Each Sweepstakes First Prize Winner will receive a HGTV HOME Flooring by Shaw 5’ X 8’ area rug, style selected by Sponsor in its sole discretion. The ARV of each Sweepstakes First Prize is USD $649 / CAD $694.43. Sweepstakes Second Prizes (300): Each Sweepstakes Second Prize Winner will receive a HGTV Tote Bag (“Sweepstakes Second Prize). The ARV of each Sweepstakes Second Prize is USD $15 / CAD $16. The total ARV of all Sweepstakes Second Prizes is USD $4,500 / CAD $4,800. HGTV 2014 Urban Oasis Giveaway Sweepstakes – Win the 2014 Urban Oasis Home & more! Win the HGTV Urban Oasis home, $50,000 and an Acura! You may also enter here. ENTRY LIMIT – Limit one entry per site (HGTV, HGTV Front Door). ELIGIBILITY – This Sweepstakes is open only to legal residents of the U.S. and its territories, possessions and commonwealths who are 21 years of age or older as of August 28, 2014. SWEEPSTAKES PERIOD – Beginning at 9:00 a.m. Eastern Time (“ET”) on August 28, 2014 until 5:00 p.m. ET on October 10, 2014. PRIZES – Grand Prize: One (1) Grand Prize Winner shall win the Grand Prize, which consists of: (i) the home located in The Residences at Mandarin Oriental, Atlanta (the “HGTV Urban Oasis Home”) that is featured in the “HGTV Urban Oasis” special (including home furnishings, fixtures, artwork, and merchandise) (approximate retail value (“ARV”): $1,675,000)); (ii) Fifty Thousand Dollars ($50,000) (awarded in the form of a check or wire transfer) courtesy of Quicken Loans. (the “Cash Prize”); and (iii) a 2015 Acura TLX SHAWD Advance automobile (MSRP: $45,595) (the “Acura Prize”). In lieu of taking title to the HGTV Urban Oasis Home, Grand Prize Winner will have the option of receiving $720,000 in cash (the “Cash Option”). If Grand Prize Winner elects to take the Cash Option, the Grand Prize Winner will still receive the Cash Prize and the Acura Prize. HGTV Smart Swag Giveaway Sweepstakes – Win accessories featured in the HGTV 2014 Smart Home! Win decorative items and accessories from the HGTV Smart Home! Come back April 15th to enter to win the HGTV Smart Home! ELIGIBILITY – This Promotion is open only to legal residents of the 50 United States and D.C. who are 21 years of age or older at time of entry. SWEEPSTAKES PERIOD – Beginning at 9:00 a.m. Eastern Time (“ET”) on April 1, 2014 until 8:59 a.m. ET on May 13, 2014, you may enter the Smart Swag Giveaway. PRIZES – Each Prize Winner will be awarded a prize package with contents based on the outcome of an online vote on the HGTV Website. The prize package will be comprised of modest-sized decorative items or accessories. Maximum approximate retail value (“ARV”) of each prize package is $1,300. HGTV’s Love It, List It, Watch It, Win It Sweepstakes – NEW CODE ADDED! Love HGTV Sweepstakes? This sweepstakes has now ended, but current HGTV Sweepstakes can be found here. I update the HGTV Sweepstakes regularly – so check back often to see if a new HGTV Sweepstakes has begun! You can also follow Sweepstakes in Seattle on Facebook, so you never miss a sweepstakes! ENTRY LIMIT – There is a limit of one (1) Entry, per person, regardless of email address used, per Entry Period. 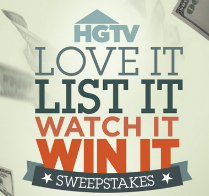 SWEEPSTAKES PERIOD – HGTV’s Love It, List It, Watch It, Win It Sweepstakes begins at 8:00:00 pm Eastern Time (“ET”) on 01/27/14 and ends at 7:59:59 pm ET on 02/25/14. Each week there will be a code word to use to enter the sweepstakes. I will update this when I have the code. Don’t forget – you will have one day to enter once the code has been shown on HGTV. PRIZES – Grand Prizes and Approximate Retail Value (“ARV”): Five (5) Grand Prizes are available to be awarded throughout the entire Sweepstakes Period (one (1) per Entry Period) (each, a “Grand Prize”). Each Grand Prize winner, once confirmed, as detailed below, will receive one (1) check for Twenty-Five Thousand Dollars ($25,000). The ARV of each Grand Prize is Twenty-Five Thousand Dollars ($25,000). HGTV 2014 Dream Home Sweepstakes – Win the 2014 Dream Home & more! Win the 2014 HGTV Dream Home, $250,000 and a 2015 Yukon Denali! ENTER SWEEPSTAKES HERE – HGTV sweepstakes page & Front Door sweepstakes page. ENTRY LIMIT – limit one (1) online entry on the HGTV Website, per valid email address, per eligible person per day & limit one (1) online entry on the Front Door Website, per valid email address, per eligible person per day. ELIGIBILITY – This Sweepstakes is open only to legal residents of the U.S. and its territories, possessions and commonwealths who are 21 years of age or older as of December 27, 2013. SWEEPSTAKES PERIOD – Beginning at 9:00 a.m. Eastern Time (“ET”) on December 27, 2013 until 5:00 p.m. ET on February 14, 2014. PRIZES – Grand Prize: One (1) Grand Prize Winner shall win the Grand Prize which consists of: (i) the home located in Truckee, California (the “HGTV Dream Home”) that is featured in the “HGTV Dream Home” special (including home furnishings and merchandise as determined by Sponsor in cooperation with the Participating Parties and installed prior to conveyance) (approximate retail value (“ARV”): $1,760,000.00); (ii) social level membership at Schaffer’s Mill club (ARV: $2,400); (iii) Two Hundred Fifty Thousand Dollars ($250,000) (awarded in the form of a check or a wire transfer) (the “Cash Prize”); and (iv) a 2015 GMC Yukon Denali automobile (ARV: $77,000). In lieu of taking title to the HGTV Dream Home (and the contents of the HGTV Dream Home), the Grand Prize Winner will have the option of receiving $1,050,000.00 in cash in lieu of the home (the “Cash Option”). If Grand Prize Winner elects to take the Cash Option, the Grand Prize winner will still receive the Cash Prize and the GMC Prize. If the Grand Prize Winner cannot take possession of the HGTV Dream Home due to a force majeure event, failure of constructions, or any other reason as determined by Sponsor in its sole discretion, Grand Prize Winner shall receive the Cash Option, Cash Prize, and the GMC Prize. Total ARV of Grand Prize is $2,089,400.00 if Grand Prize Winner takes title to the HGTV Dream Home or $1,377,000.00 if Grand Prize Winner selects the Cash Option in lieu.